Western furniture provides a relaxed and comfortable feel that is inviting to your family and friends. 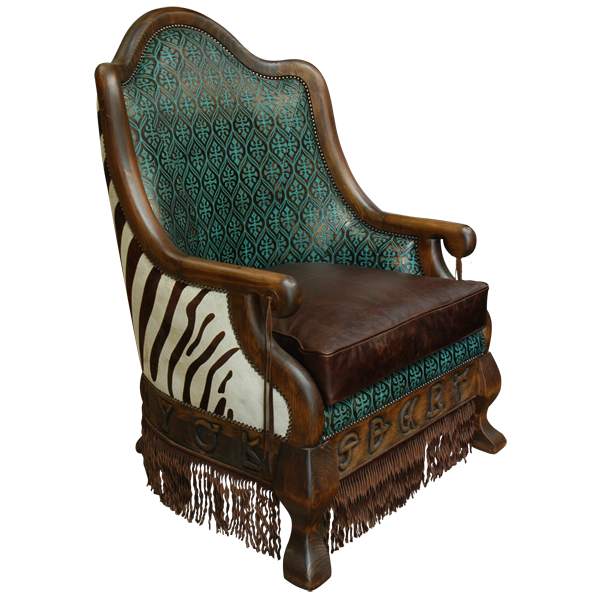 This beautiful, handcrafted Western style chair will be a wonderful addition to your Western décor. The stained wood molding of this custom chair runs from the top of the shield shaped seat back to the end of the armrest. 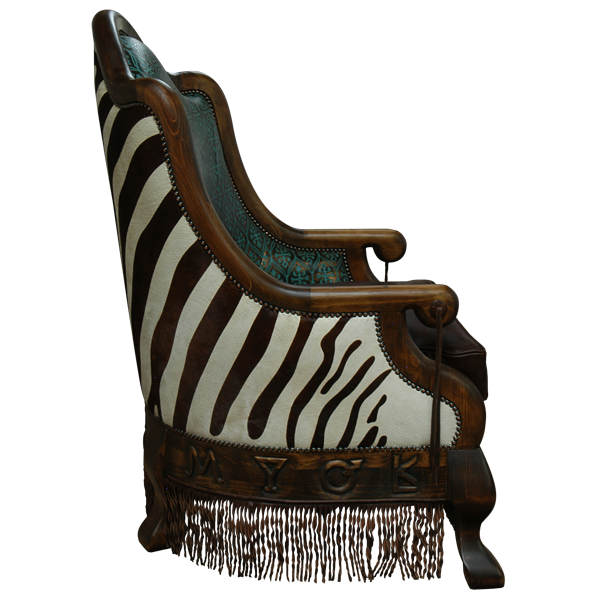 This chair rest on exquisitely, curved cabriole legs. The sides of each armrest are decorated with a hand forged iron concho with long, decorative leather cords. Leather fringe is hand tacked to all sides of the lower base of the chair. The lower, solid wood rim can be adorned with your hand carved initials or your ranch brand. The seat is upholstered with rich, brown full grain leather. 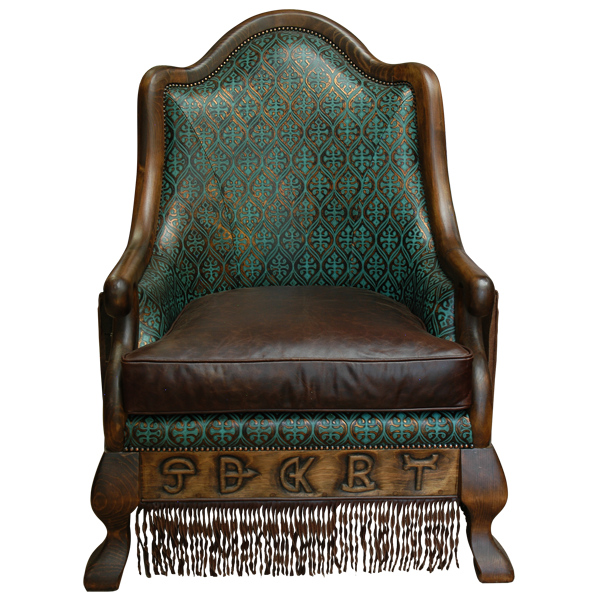 The inside seat back and the lower front of the chair are upholstered in turquoise patterned, embossed full grain leather. 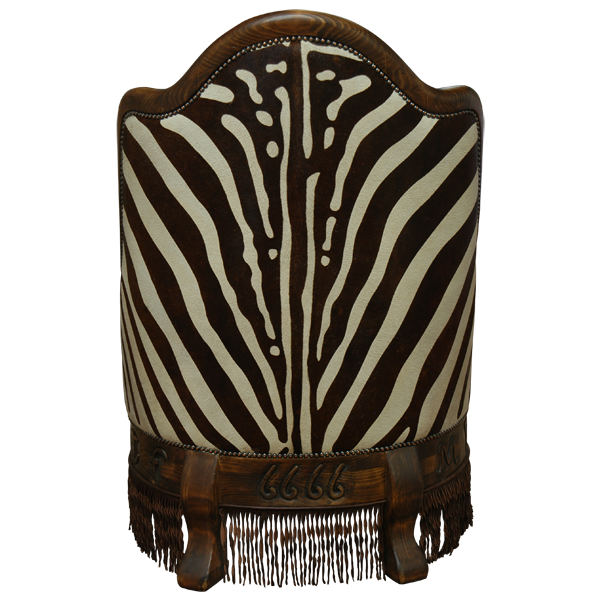 The reverse seat back and the sides of this chair are upholstered in exotic, simulated, zebra patterned, real cowhide. The leather upholstery is double stitched together for extra strength and durability. Also, the upholstery is precision hand tacked to the wood frame by our skilled craftsmen. Both beautiful and durable, the chair is made with the best, sustainable wood available. It is 100% customizable.